Following the previous two (sold out) Independent Birmingham festivals, the first at The Bond Company in Digbeth and the second at the iconic Aston Hall (where upon 2000 people descended on the beautiful heritage site for a fun-filled day of feasting, drinking, shopping local and rocking out to live music on our main stage), we decided you guys needed another ace event in your lives. 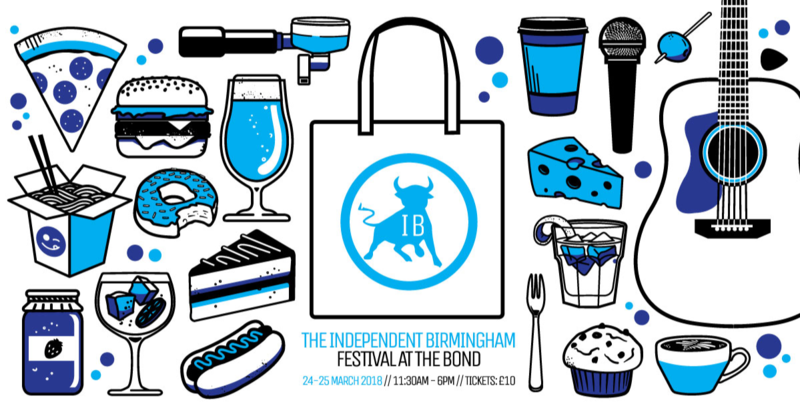 Introducing The Independent Birmingham Festival At The Bond. Join us on Saturday 24 and Sunday 25 March for another great IB festival. If you managed to get tickets to either of the previous sold out events, you’ll know what we’re all about. If it’s your first time, then you can expect a truly spectacular line-up of pop-up restaurants, cocktail bars, street food, craft beer, independent retailers, artists, designers and makers, along with a full programme of live music and entertainment. Our previous two festivals had amazing line-ups, and once again we’ve curated a ridiculously awesome line-up for this event (seriously folks, it's really is something special). You won’t want to miss it! Mouth-watering food, delicious cocktails and craft beer, a roster of the finest independent retailers, artists, designers and makers, and local bands rocking out on our main stage - sounds like an incredible event to us. We’ll see you all there. Note: our last two festivals sold out weeks in advance. Be sure to grab your tickets early to avoid missing out - it really is set to be a special weekend. Also, the food/drink/retail line-up will be the same for both days, so you only need to purchase tickets for either day and there will be no weekend tickets available. YOU DO NOT NEED AN INDEPENDENT BIRMINGHAM MEMBERSHIP CARD TO ATTEND THIS EVENT.